10 co-design pressure cookers with SMEs, user involvement experts and design agencies. Usually the presumption is SMEs do not have the budget, skills nor knowledge as large companies do to thoroughly involve users in their process. Christine’s project is about to prove user involvement for SMEs is possible and profitable! PhD candidate Christine deLille is doing her research for TUDelft and Hogeschool Utrecht. For this pressure cooker project she worked together with Syntens and Province of Utrecht. Today she presented her findings to a small group of people from Denmark, starting a likewise project. All projects were finished satisfactory, 2 resulting in patents and 2 in a follow-up! SMEs were amazed by their customers, the richness of qualitative insights and new methods. 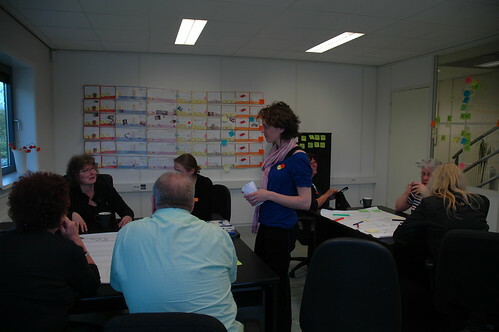 Some SMEs are applying user involvement methods already themselves now, with experts as coach. An advantage of SMEs above large companies is that SME’s are much more flexible and faster in adapting and changing. Although they lack the budget, skills and knowledge for elaborate user involvement, changing an SME’s mindset and strategy because of any new user insights is much more likely than a large company’s one. So for SMEs: start yourself, start small and start today! For design agencies a certain budget and time is needed for projects involving users and co-design. It can’t just be narrowed down to a few hundred euros or a few hours. It was very interesting to see the final conclusions of the projects we worked on. Christine presented the project very good and clearly. Good to see that awareness of the value of user involvement is growing. Most of her findings we recognized and experienced in our cases as well and we learned as much as our 2 SMEs! For me it was really cool to be the practitioner in these quick cases. In this short time we created much energy and results! As designers and co-creation experts we invested some extra time in these projects, because we of course wanted to make the best of it so at the end we put more effort in the projects than we got paid for. So I hope to gain more experience to do these projects more efficiently, or maybe Christine comes up with a suggestion of combining more interested stakeholders for the same user insights, to make it more profitable? PS. Next to being curious about Christine’s results and the Danish project, the reason I was attending the presentation today already is that the 11th is also the date of the event DesignforConversion, but that will be another blogpost.